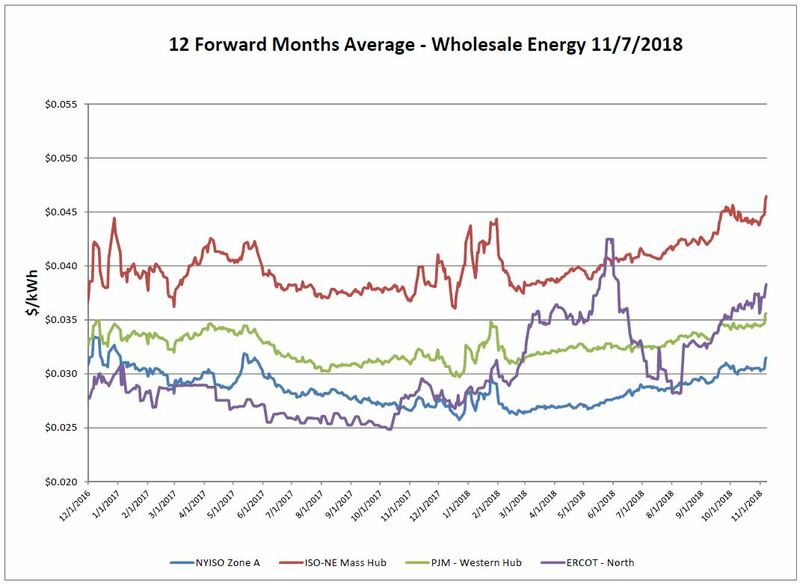 The natural gas markets experienced a gap up in prices over the report week, in turn impacting the price of electric in all markets. ISO- NE had been on somewhat of a downward slope prior to this run up. It is important to keep in mind how the generation mix will continue to change in the coming years. In NY, Indian Point Nuclear Plant is set to phase out in 2020 and 2021. This plant supplies approximately 1/3 of the power going into NYC. Although renewables are on the rise, this will not be enough time to get enough generation capacity to replace this closure. Likewise, in New England, Pilgrim Nuclear Power Plant is slated to close in 2019. With this being said, forward prices in the out years are still attractive. It may be wise to explore hedging strategies for your business to shield from the potential effects of these looming situations. 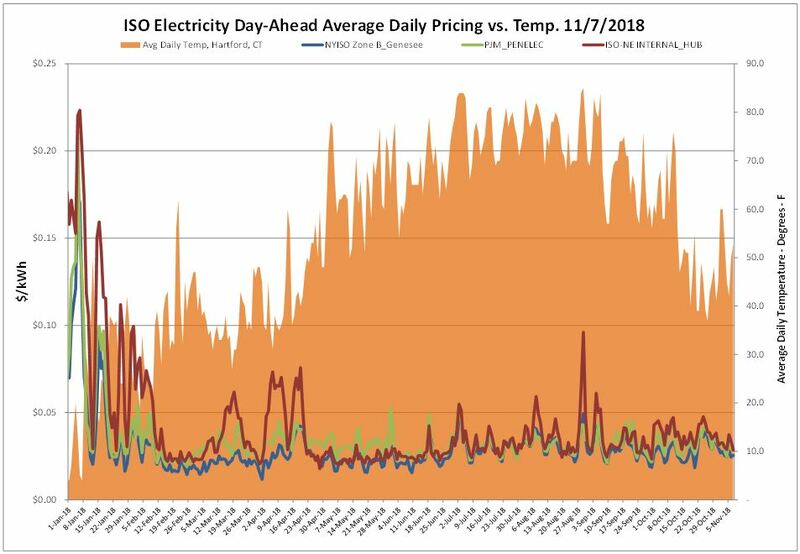 *Please note that the date and per kWh axis for this graph have been updated in an effort to focus more definitively on the most recent price changes. Day-ahead electric prices were relatively stable considering the market variables. Cooler temperatures anticipated for the coming weeks, and anxiety over the upcoming winter forecast caused tension in the markets. 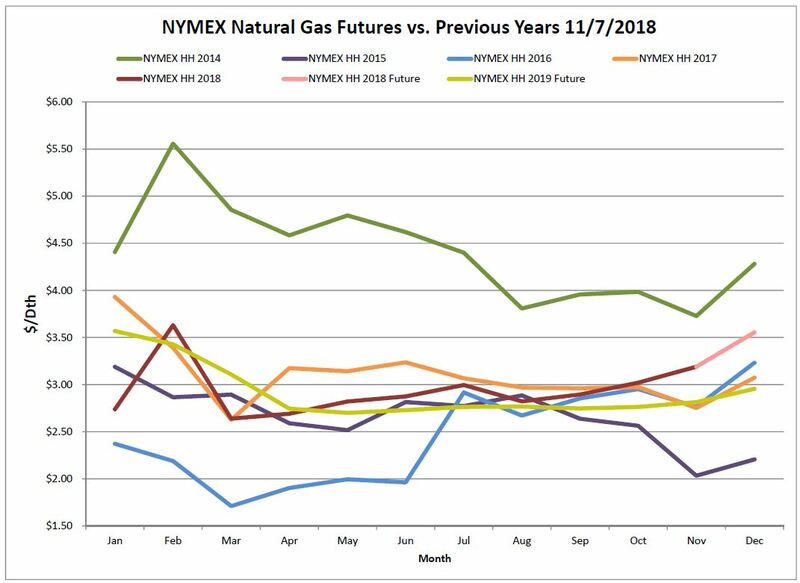 The price of the December 2018 NYMEX contract increased 29 cents week over week. The price of the 12-month strip averaging December 2018 through November 2019 futures contracts climbed 10 cents to $2.974/Dth. Natural gas stocks ended the traditional refill season lower than the five-year minimum range. 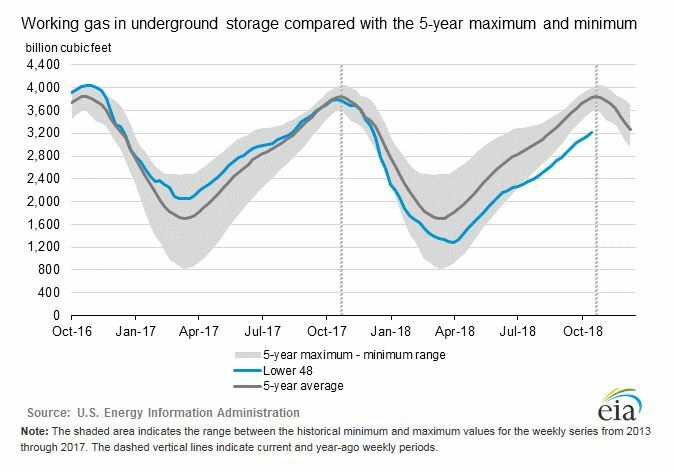 According to EIA estimates, working gas in storage was 3,208 Bcf as of Friday, November 2, 2018. This represents a net increase of 65 Bcf from the previous week. Injections often occur into November, however the traditional natural gas storage injection season is April 1 through October 31. A low starting inventory level and increased demand for natural gas contributed to this relatively low level. Although production levels have been well above where they have been historically, it is unfortunately a story of “too little, too late”. 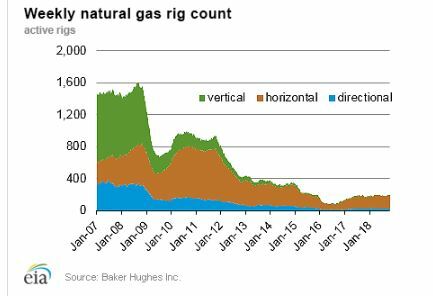 The Baker Hughes exploration gas rig count increased by 2 rigs week over week for a total of 195 rigs. This is 26 more rigs than were in operation at this time one year ago when there were 169 rigs. 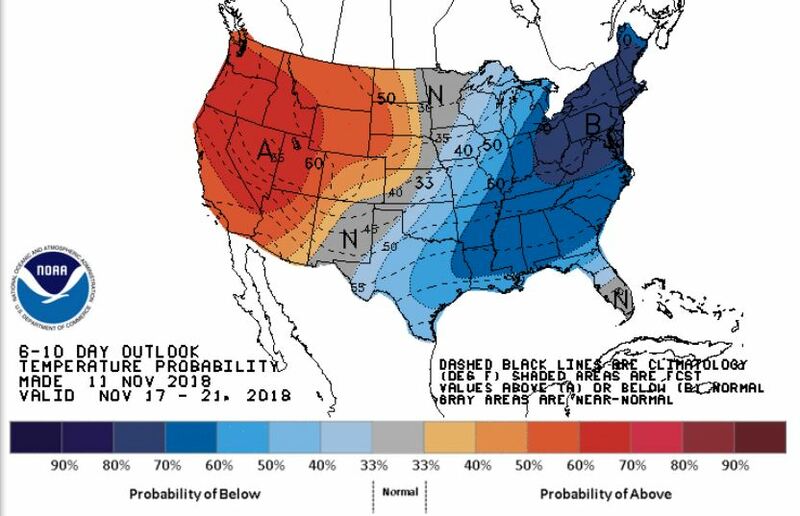 Mid- November forecasts continue to anticipate very cold temperatures in the Northeast. Colder than normal temperatures are expected for much of the Eastern half of the CONUS, while the Western half of the country will experience warmer temperatures. As the hot summer approached, Texas leaders expressed concern about potential blackouts and brownouts.